This is the fourth and concluding post in a series that explores and attempts to clarify the boundary between authentic Mexican dance masks and other invented (or “decorative”) masks that pretend to be authentic. This boundary had become dramatically blurred after the publication of Donald Cordry’s book, Mexican Masks, in 1980. It would be easy to wonder about the value of Donald Cordy’s book—Mexican Masks—after learning that two thirds of the masks can be described as falsely presented (or “decorative”). In the last two posts I called your attention to the fact that the masks that make up the other third are not simply good, but frequently great. Today’s post will identify and examine the decorative masks in this book. For those of you who are joining this blog for the first time, there is a very brief explanation of “decorative” masks in the FAQ section (Question 7), a very detailed discussion in my post of August 4, 2014, and further comments by my friend Charles Thurow in the post of August 20, 2014. As I noted in earlier posts, any attempt to specify exactly which of these masks is decorative is likely to contain an occasional error. The problem is this—there are so many variations in mask designs and related dances in the villages and towns of Mexico, and so many independent carvers, that no single person can possibly know everything that there is to know about these variations. In recent posts I pointed out instances of disagreement between myself and a very knowledgeable collector, Jaled Muyaes. I noted other instances when the two of us agreed that we didn’t know the status of a particular mask or group of masks. In spite of this inherent ambiguity, various experts have made some effort to define those masks that are decorative. I introduced their work in my post of August 4, 2014. Despite their writings, which are admittedly in relatively rare, inaccessible, and out of print books, typical decorative masks like those in Cordry’s book continue to show up for sale, for instance on EBay™, with descriptions that suggest that these are authentic and traditional. That is, such masks continue to be falsely presented, despite Ruth Lechuga’s careful explanation in 1988 (in Behind the Mask in Mexico, edited by Janet Esser). This is why I have chosen to tackle this subject on these pages. I believe that the continuing false presentation of these masks has actively discouraged the appreciation of a huge body of remarkable Mexican masks that are traditional, authentic, and meaningful within their respective cultural contexts. Furthermore, this inaccurate labeling tends to discredit the invented masks as well, by inviting us to evaluate them according to specious attributes, rather than on their own merits. Nor do the prospective sellers of these masks benefit, when their erroneous and inflated ideas about the value of these masks frequently prevent the masks from finding buyers, even though there are collectors who appreciate these non-traditional masks as folk art. In my last post (August 18, 2014) I was pleased to include many photos to illustrate the sort of authentic masks that are found in Mexican Masks. I wish that I could do as much for the decorative masks, but I have actively avoided their collection, so that I have very few of them. Fortunately my friend Charles Thurow, along with his late partner, Dale Hillerman, had chosen to consciously collect masks that we might have called decorative. Despite knowing the true origin of these masks, they nevertheless thought of them as great folk art. Charles has permitted me to photograph masks from their collection, I included some of the traditional masks in my last post, and today I will gratefully present the non-traditional masks, but without false labels. I want to reiterate that although I will refer to these masks as “decoratives,” we could as readily refer to them as examples of folk art, provided that they were accurately labeled. The problem is that they are falsely labeled in Cordry’s book, whereas the examples that I will include from the Hillerman/Thurow collection will be free of such fiction and fantasy. Therefore in this week’s post I will call each of the mislabeled examples found in Mexican Masks decorative. It has been an interesting experience for me to revisit the decorative masks in Cordry’s book and to see them through the eyes of Charles Thurow. As I noted in my August 4 post, and as Charles further explained in a special post of August 20, 2014, he prefers to focus on these masks as remarkable artistic creations by individual artists. He is not insensitive to the problematic nature of their labeling and marketing, although he also perceives this aspect as a reflection of the long history of miscommunication and sparring for advantage between indigenous peoples and those of European descent. Equally interesting has been my recognition of patterns within this heterogeneous collection—to essentially observe the unfolding or invention of these masks in a sequence that reflected the interaction between Cordry’s curiousity and the desire of his opportunistic dealers to accommodate him. I can’t say that I know what came first and then what else came next, but rather I can see the breadth of variations that were provided in response to Cordy’s inquiries, and I can see how interesting that process became for Cordry, and potentially for some of us. In my last post, I discussed the traditional masks in their order of appearance in Cordry’s book, acknowledging the unique nature of each mask. I will approach the decorative masks with a different strategy, grouping them into arbitrary clusters. I am not particularly pleased with this clustering task, as it must sometimes hinge on false ideas or labels instead of the actual mask forms; for the sake of discussion I have to start somewhere. Plate 10 (page 7), “Vaquero, Vaquero Dance, Guerrero.” This mask has an articulated jaw that is connected to the central section of the beard, creating a large swinging panel. Of all the masks in the book, this is one of the strangest. Plate 16 (13), “Probably for Dance of the Marquez.” This is a good example of the most impressive and beautiful of the Baroque style decorative masks, carefully carved from cedar, and with the misleading appearance of great age and wear. At least five near duplicates appeared in the Celebration of Masks book. I am sorry that I don’t have a good photograph of this type to include here. Plate 32 (27), “Barbones (Bearded Ones) masks, Dance of the Marquez and others.” These masks have pink faces and elaborate beards. Although dramatic, they are not quite as impressive in appearance as the one in Plate 16, and they are made of zompatle wood, which is lighter, more fragile, and more easily carved than cedar. Plate 188 (138), “Dwarf Masks, Dance of the Dwarves.” These resemble those in Plate 32, although they have been attributed to another dance. 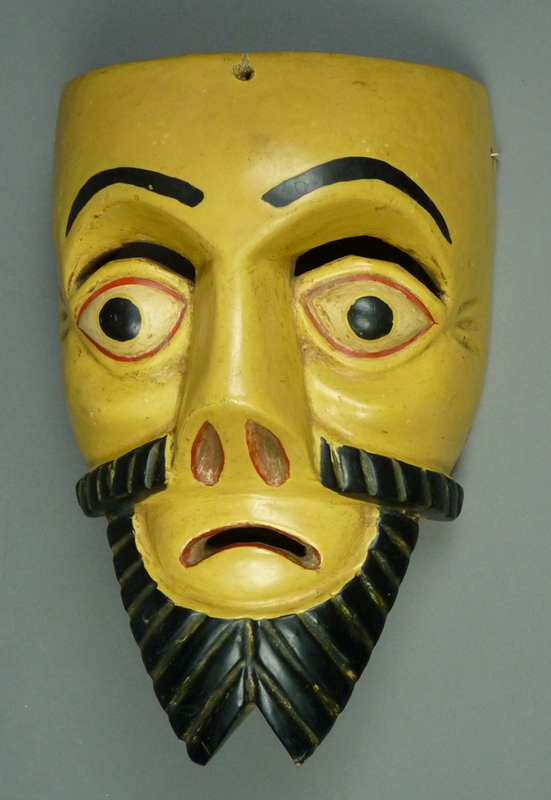 Here is a mask similar to those in Plate 32, from the collection of Charles Thurow. This is certainly a dramatic carving. This particular mask resembles the central statue at the Trevi Fountain, in Rome. Today I received the following comments from my friend Charles Thurow, in response to the last three posts on the subject of Decorative masks and Donald Cordry’s book, Mexican Masks. Because his ideas allowed me to present a far more balanced discussion, I am pleased and honored to pass these further remarks along to you in a separate post. In next weeks blog, which will focus on the “Decorative” masks and related treasures of Mexican folk art in Cordry’s book, I will include some of the non-traditional masks from Charles Thurow’s collection. Because they are being honestly presented as contemporary creations, and not falsely as ancient cultural treasures, I will pointedly avoid calling Thurow’s masks decorative. The rest of this post was authored by Charles Thurow, from Chicago. This is the third post in a four part series that explores and attempts to clarify the boundary between authentic Mexican dance masks and other invented (or “decorative”) masks that pretend to be authentic. This boundary had become dramatically blurred after the publication of Donald Cordry’s book, Mexican Masks, in 1980. In last week’s post, I explained the mixed nature of Donald Cordry’s book, noting that it has so much to teach us, because it is filled with excellent examples of the real, the false and the ambiguous. I emphasized that the dance photos and the photos of carvers with their work provided valuable information, and I gave examples. This week I will discuss the authentic traditional masks in this book and next week I will survey the decorative masks. I should begin with a caution. Because the traditional masks in Mexican Masks are so good, they will generate a long list, but one that would be dry and boring in the absence of any illustrations. I lack permission to reproduce the actual photos from the book, and I doubt that all of my readers will already own Cordry’s book, so my solution is to introduce similar or related photos of masks from my collection or from the collections of others. I could simply include a few photos to whet your interest, but because the topic is so rich and important, I have decided to present many photos in order to properly celebrate the positive elements of this collection. It is unlikely that my future posts will have anywhere near the number of photos that you will find in this one. I have gone to such lengths with the greatest pleasure. Plate 2 (page viii), a Rastrero of leather and fur. Jaled Muyaes did not question the authenticity of this mask. I do not presume to know if it is authentic, but I like the simplicity of the design features. Plate 3 (page 2)- two excellent Corcovi masks from Michoacan. The one on the left appears to be much older, that on the right was carved by Victoriano Salgado Morales, of Uruapan, Michoacán. 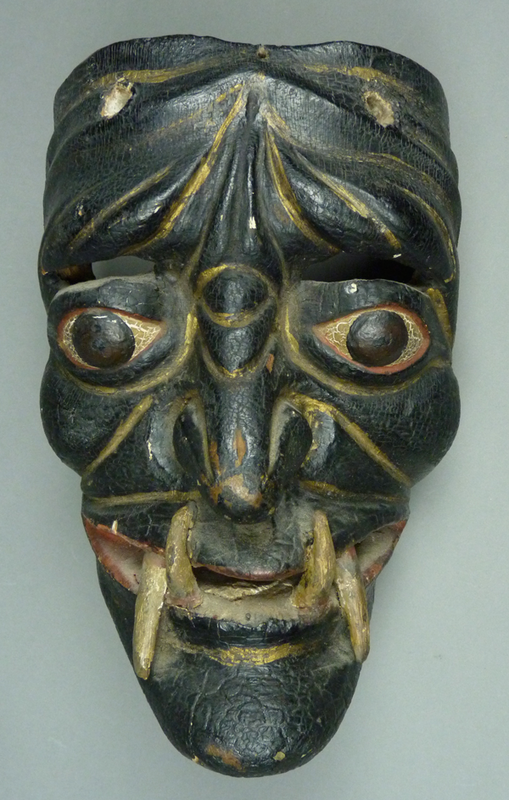 Here are photos of a Corcovi mask from my collection, carved by Victoriano. A Corcovi mask by Victoriano. I bought this on EBay, in 2010. Last week I initiated a review of decorative masks from Mexico. Briefly, these are masks of artistic design that have the appearance of heavy wear and use, they are said to be associated with ancient traditions, and they reportedly come from isolated but identifiable towns. Unfortunately, most of the documentation that accompanies these masks has been found to be false and invented, while the masks themselves have fantastic and exaggerated designs, and they have been falsely aged. These masks had appeared in great quantities in the latter decades of the 20th century, and became popular in North America due to the influence of one large and beautiful book, Mexican Masks, by Donald Cordry. Cordry had collected hundreds of these masks, thinking that they were not only authentic, but also remarkable, so remarkable that they deserved to appear in books and museums. It seems that few observers were aware of these masks until Cordry’s book appeared in 1980, two years after the author’s death. For many years I have thought about writing a new version of Cordry’s book, one that praised the best masks, exposed the decoratives, and filled in the gaps. After I began publishing this blog, it occurred to me that I could begin to tackle that project in a series of posts. Last week’s writing on Decorative masks was the introductory installment, and this is the first of three posts that will directly examine the contents of the Mexican Masks book. 1. Catálogo de Máscaras del Estado de Guerrero de las Collecciones del Museo Nacional de Antropología, by María Teresa Sepúlveda Herrera, published by the Instituto Nacional de Antropología e Historia in 1982. 3. “Mask Making in Guerrero”, an essay by Ruth Lechuga, in Behind the Mask in Mexico, edited by Janet Brody Esser, and published by the Museum of International Folk Art in 1988. As you can see, by looking at the dates of these books, there was a progressive accumulation of knowledge. By 1988, the situation had become clear—these masks were false. However, they were not all false. Intermixed in Cordry’s book with this admittedly large group of decorative masks were others that were accurately identified, genuinely worn, rare, and truly wonderful. How could this be? As a young, healthy investigator and artist, and with the active support of his wife, Dorothy, Donald Cordry was a pioneer in the investigation and collection of Mexican folk art. This couple traveled on horseback and on foot into isolated mountainous areas, and they documented what they discovered with photographs. They were particularly interested in masks and weavings, and supplied these things to museums, such as the Museum of the American Indian, in New York City. Subsequently Donald established a workshop in Cuernavaca, where he directed artisans who produced Mexican crafts. Based on their research, Donald and Dorothy Cordry wrote a book about Mexican Textiles—Mexican Indian Costumes, which is considered a landmark book in this area, and for which they were awarded the Fray Bernardino de Sahagún Award in 1968 by the Mexican National Institute of Anthropology and History. For this work, the Cordrys were highly respected. In his middle years, Donald Cordry’s health went into a severe decline. He had one or a series of strokes, he grew weak, and he was no longer able to travel. He had to settle for studying objects of folk art that came to him. Some unscrupulous individuals, let’s call them “operators”, took advantage of this situation. 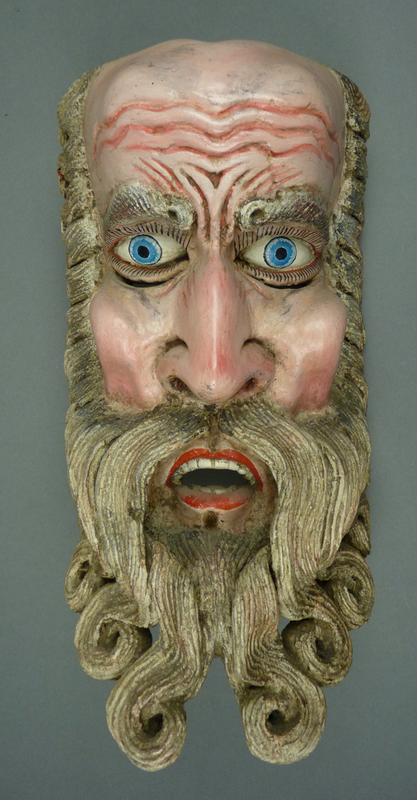 Having commissioned the production of false masks, they developed false aging techniques, invented histories for these masks based on real or invented dances and towns, and offered these masks to Donald Cordry, as if they were rare treasures. In his forced isolation due to ill health, Cordry was apparently grateful for this flow of material. So here we are. We have a book—Mexican Masks—that has so much to teach us, because it is filled with excellent examples of the real and the false. It would be more accurate to say that it is filled with the real, the false and the ambiguous. My task is to help you to identify the masks in these categories. Actually, I have already started to do so, by pointing out the sort of stylistic clues that will help you to identify the masks of a particular carver, and by illustrating the concept of “differential staining” that occurs from authentic use. Fortunately, we do not have to do this alone, as we have the assistance of the authors of the three books that I just listed, along with additional advice from one of the great Mexican experts, Jaled Muyaes, of Mexico City. On February 26, 2005, Jaled, his daughter Karima, and I had gone through Cordry’s mask book together, noting our opinions of each mask. Plate 7 (on page 6) is a great example of a valuable photo, along with another from the same place and date, plate 307 (page 247). Taken in Cherán, Michoacán, in 1935, these views of la Danza de la Pastorela (the Shepherd’s Play) reveal a terrific mask of a Hermitaño, and two views of a pair of Diablos, one with a human face and the other with the face of a bull. In 1995, I purchased a beautiful old Diablo from Spencer Throckmorton, which was found near Lake Patzquaro, Michoacán. It had four holes around the forehead, each 3/8” in diameter; I wondered about the purpose of the holes. Then I realized that this mask was by the same hand as the human faced devil in Cordry, but that the latter had four thin snakes attached to the forehead. Thus my question was answered. Here is the Diablo mask from Lake Patzquaro, Michoacán. 2. Máscaras, by Estela Ogazon, published by the Museo Universitario de Ciencias y Arte, in 1981. “All of the masks in Máscaras are good. While I do not necessarily agree that they are all labeled correctly, they are all excellent and real.” I would agree. 3. A Celebration of Masks: Mexican Masks from Chicago Collections/ Celebración de Máscaras: Máscaras Mexicanas de Colecciones de Chicago, Mexican Fine Arts Center, Chicago, 1984. Barbara was intrigued that this book demonstrated the influence of Cordry’s book on American collectors. 4. Changing Faces: Mexican Masks in Transition, by Lori Jacobson and Donald E. Fritz, published by the McAllen International Museum, in 1985. Barbara noted that Changing Faces provided the best discussion about the flood of Mexican decorative masks that had appeared in recent decades. It was a book that every aspiring collector of Mexican masks simply had to read. 5. Mascaras: La Otra Cara de México. Masks: The Other Face of Mexico (3rd edition), by Victor José Moya Rubio, published by the Universidad Nacional Autónoma de México, in 1986. Barbara described Moya Rubio’s book as another instance where wonderful material was mixed with an occasional false or decorative mask. The great things were not to be missed. I am adding the suggestion for the 1986 printing, because the third edition is bilingual, and thus particularly useful. 6. Behind the Mask in Mexico, edited by Janet Brody Esser, and published by the Museum of International Folk Art in 1988. 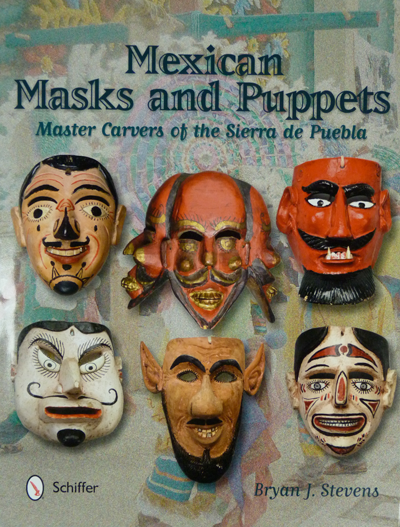 The museum, in Santa Fe, New Mexico, created a truly wonderful traveling exhibit on the subject of Mexican masks and dances, and with it this accompanying book. 7. Catálogo de Máscaras del Estado de Guerrero de las Collecciones del Museo Nacional de Antropología, by María Teresa Sepúlveda Herrera, published by the Instituto Nacional de Antropología e Historia in 1982. 8. Museo Nacional de la Máscara, San Luis Potosi, Mexico: Catálogo, published by FONAPAS (Fondo Nacional para Actividades Sociales), circa 1981. This volume provides a fuller listing of the Moya Rubio collection, with valuable information regarding the dance and the place of origin for many good masks. Recently Tom Pirazzini provided me with a copy of his self published book—Dealers of Mexican Folk Art. This begins with a valuable list of reputable dealers, followed by an extensive list of interesting web sites, then morphs into a long and interesting discussion of decorative masks that extends from page 10 through page 25. I will include some of his ideas and observations in the discussion that follows.